Around 30 percent of the storage solutions at Dutch company offices with 50 or more employees come from HPE. These figures make HP the market leader by far. Dell occupies second place. Around 16 percent of the storage solutions come from Dell. 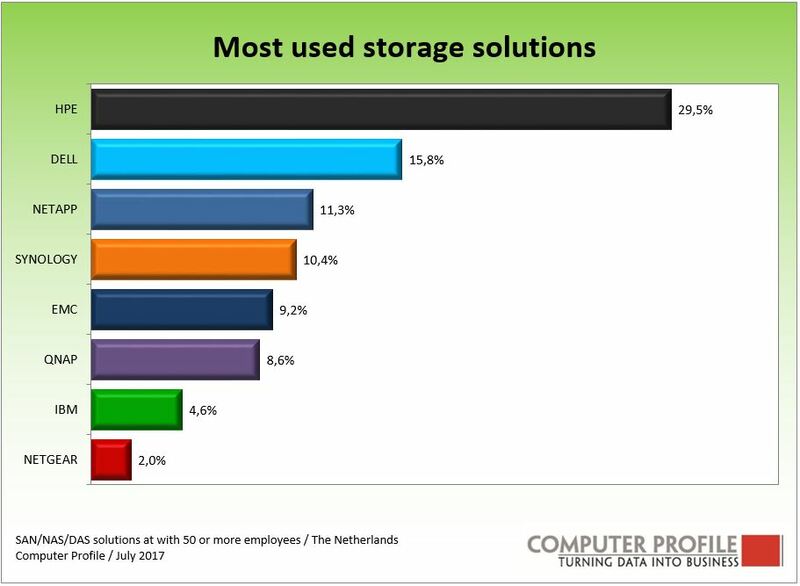 NetApp, Synology and EMC complete the top five with respectively 11, more than 10 and 9 percent of the total number of storage systems. In comparison with the shares of one year ago, Synology has gained several percentage points. This has emerged from Smart Profile analysis of around 3,300 interviews about storage systems used, which were conducted with IT managers of company offices with at least 50 employees. For this analysis the researchers looked at the Direct Attached Storage, Network Attached Storage, and Storage Area Networks currently in use. If we look at the individual storage applications, HPE shows a share of 38.5 percent in the total number of SAN solutions. The shares for each vendor are more or less the same as a year ago. 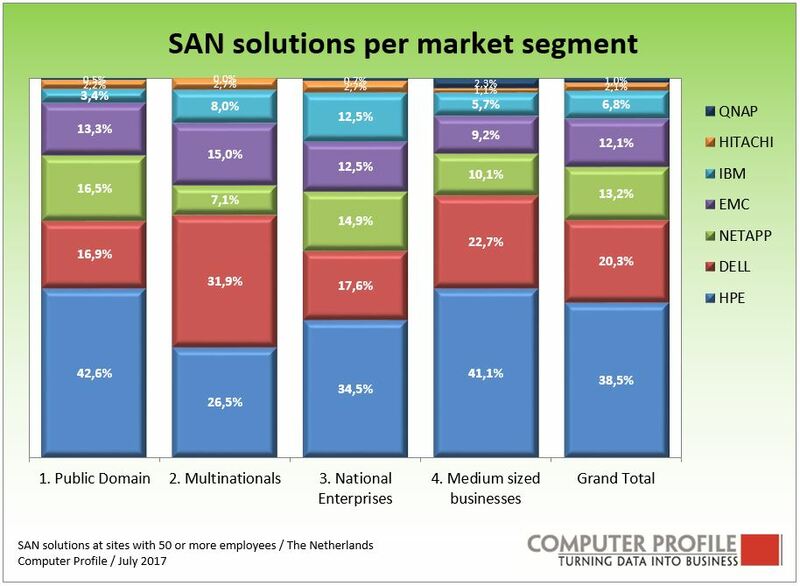 With a share of 20%, Dell is also the number two for SAN solutions. NetApp and EMC together complete the top three, with a share, respectively, of around 13.2 and 12 percent. Synology has increased most in comparison with last year. For Network Attached Storage there are some names on the list which don’t appear at all on the San systems market. 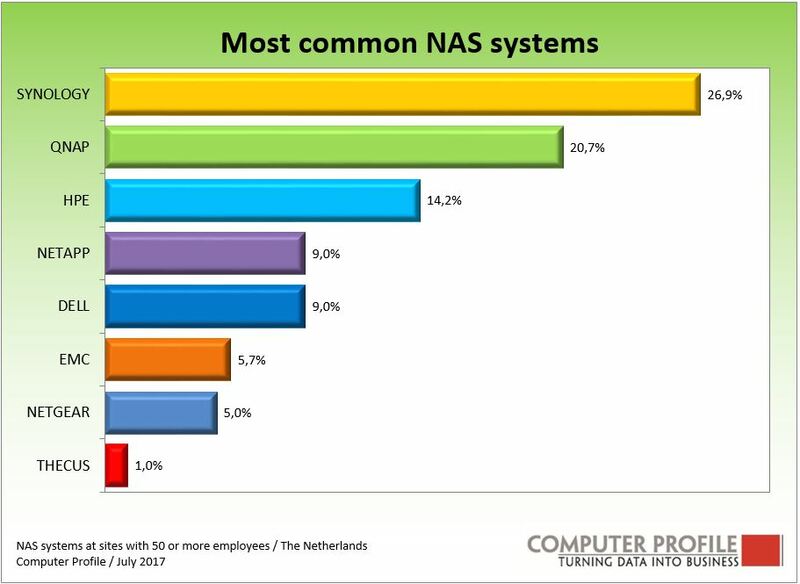 Synology sprints ahead in first position, with 26.9 percent of the total NAS systems (compared to 21.6 percent last year). Qnap is also doing well and has captured the 2nd place from HPE with 20.7 percent. HPE is at number 3 with 14 percent. The percentage of those interviewed who said that they store data on tape has clearly fallen in recent years. 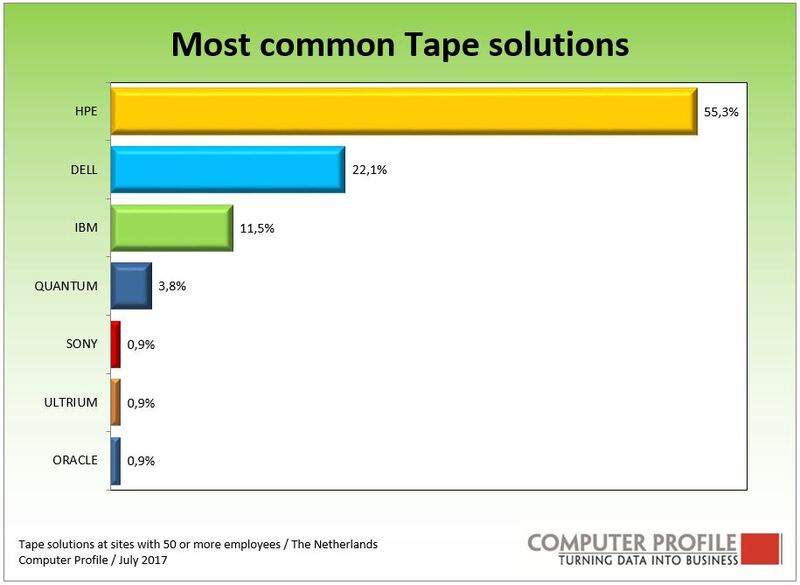 At the start of 2013, a tape solution was still in use amongst 41% of all systems. In 2014, this figure was 33% and at the moment it is a mere 13%.IBM has set a new record of 201 Gb/in2 (gigabits per square inch) with developments on tape storage, so perhaps something is about to happen in this area. HPE assumes the most important position at these locations, 55.3 percent of the tape solutions concern an HPE solution. Dell and IBM still also have a considerable share in the installed base. All other named tape solutions together account for the remaining 10%. The shares for each vendor have largely stayed the same as compared to one year ago.